Ahhh, my word for this year. It came to me while we driving to the Christmas tree farm. At the time it seemed logical. Necessary. Just… like a fresh breath. Like coming up for air. Like a big giant YES. But as I sat with it, it got really scary. It felt really big. It felt like a step I wasn’t ready to take. I completed my Powersheets and my word was all over the place. I completed the shortened 2017 Goals with Soul process that Danielle LaPorte put out this year. And, again, my word was at the top of the list. I toyed with wayfinding (from this amazing podcast that Tina pointed me to). And I tried on coddiwomple. But they just weren’t it. So here we are. A week into 2017. And I’m ready to tell you. My word for 2017 is unfurl. It comes from a prayer from the Desire Map. I accept my calling: to show up and shine, unfurled and honest. As I typed that line just now, my friends, I got tears in my eyes. My calling isn’t a certain achievement. It isn’t a number or a pose or a job. My calling is to show up. the Desire Map and my Body. I'm not being paid for this in any way, just so you know. My links are not affiliate links. I just think Danielle Laporte is just the sh!t. And my spirit animal. And my Patronus. I have worked through The Desire Map about a dozen times. And every time, I think the same things. I already know of all of this. I'm not going to learn anything new about myself. I already have my Core Desired Feelings. I already know how this works. It is too predictable and I'm going to get stuck. And then BAM. She gets in my head and I get out of my head and magic happens. I have so much swimming in my head right now that I wanted the process, but working through the actual book seemed like too much. I got the email for the 2017 Goals with Soul package and I was like "yup, that's for me." I sat down with my phone, my headphones, a few pens, and my bullet journal. And, after a few lunch breaks, I had 2017 all figured out. But what struck me more than figuring out the direction for 2017 was the radical shift in how I feel about my body. One of the exercises in this process is looking at where you are dissatisfied with different areas of your life. I rocked through most of the categories, seeing so much opportunity for big change and little tweaks. I was able to see where things fit together and where positive change here could impact positive change there. And how neglecting my spirituality was impacting my lifestyle. All of the bells were going off. In unison. It was a little amazing. But then? Body and Wellness. And I was stuck. Honestly. Where am I dissatisfied? What do I want to change? I came to a full stop. I sat back in my chair. If I had decided to make New Year's Resolutions, they probably would have all been in this category. I would have said that I wanted to run a half marathon again. Or maybe master a yoga pose. Or maybe be vegan for a month or hit 10K steps every day or take my lunch every day or be more disciplined with my self-care routine. But nope. I am not dissatisfied with my body or my wellness right now. I initially thought that maybe it is because I have more pressing concerns, maybe I am in denial. But the truth? I am in a good place. I practice yoga every day. I eat (mostly) intuitively. I walk a few miles most days. I take my vitamins most days. I drink a lot of water most days. I do a lot of *mosts. * And that is enough. That is PLENTY. And I am satisfied. I know this probably sounds like I'm bragging. Like I'm saying, "SEE! LOOK WHAT I DID!" But that's not the case at all. What I'm saying is that I assumed I was dissatisfied. I assumed I was frustrated. I assumed I wanted more. When the reality is that I AM OKAY. I am PLENTY. Where are you making assumptions? Where are you assuming that you are unhappy or unsatisfied? Where could you really just be OKAY or even PLENTY and just. It know it yet? What do I think I am I missing here? How would this really change my life? Is this true or just a leftover thought? Can you allow yourself to see your okayness? Can you allow yourself to back out of empty struggle? Can you stop being dissatisfied just out of habit? Prayer flags are hand-sewn in my cat-friendly home. Sending intention and beauty from my sacred space to yours. Two sizes in each color. Free US shipping. Shop will close for Christmas on 12/19. November has always been a special month for me. Okay, maybe that is because I was born in November. But still. November is when things start to get still and dark. When I want to settle in and get grounded. And for the last several years, gratitude has been my go-to method of connecting. Of remembering. Of finding peace and reason when times get bleak. I believe we see what we look for. And I want to make an effort to look for reasons to be thankful. Colors :: Orange. Yellow. Brown. Inspired and gifted to my sweet friend, Min. For having a dream and letting me be a part of it. For giving me a Yoga Home. These flags are not carefully measured. They will ravel over time. They are hand-sewn with love in my cat-friendly home. These flags are inspired by my study of the chakras. Our energy can get stuck - kinda like going around and around on a roundabout. I want to remind you that you can break your cycles and your patterns. By learning to listen to yourself, your body, your needs, you can get unstuck. Here's to putting your trust in your gut instead of your fear. And getting moving. Colors :: Primary colors. White. Gold. Flags were inspired by and gifted to Laura and Kate. Prayer flags represent the tradition that the wind carries the intention of the prayers to all. These flags were created to carry bravery from my home to yours. You know where you need a little extra reminder to be brave. It may be a new project, personal or work. It may be a chance you are taking in a relationship. It may be a move or an investment or a song. Allow these prayer flags to infuse your space with bravery and strength. Colors :: yellow. aqua. pink. Inspired by and gifted to Cassie, at the start of our exciting adventure. Prayer flags represent the tradition that the wind carries the intention of the prayers to all. These flags were created to carry stick-to-it-iveness from my home to yours. Colors :: blue. purple. pink. green. Inspired by and gifted to Miranda, upon the purchase of her new house. Prayer flags represent the tradition that the wind carries the intention of the prayers to all. These flags were created to carry hope from my home to yours. I created this set as a commitment to being open to the possibility of self-acceptance. As a hope that the recipients of these gifted flags would grow in their sense of enough-ness. But hope doesn't stop there. Maybe you are hoping for health or a better job or a mended relationship or just an easier day tomorrow. I want you to know that, even though you may be hoping for something, you are enough - you are plenty - just as you are today. Colors :: orange. mint green. melon. gold. Inspired by and gifted to my first Whole-Hearted small group, at the end of our brave body-positivity work. A reminder that things bloom. We plant seeds - seeds that are tiny and seem so insignificant. And we water them and we nurture them. And then things bloom. A reminder that nature operates on a cycle. Death and growth. Nurture and harvest. A reminder that the other side is coming. Dark, cold, dreary winter is always followed by a bright, blooming spring. A reminder that even when things are good, they aren't free of upheaval. There is a lot of rain in the spring. Inconvenient, sometimes scary, and life-giving rain. It is coming just in time. As we continue our Konmari work, I have been curious where her ideas best fit within yoga philosophy. Aparigraha is the concept of non-attachment and non-hoarding. And, literally, I think that represents so much of our work to free our home from unnecessary possessions. Most of the focus here tends to center on money and posessions, but it also speaks so much toward goal pursuit and self-acceptance. This process has been clear in my life with the purging of our posessions and our financial reign-tightening. But I also love the next steps that both Konmari and Aparigraha present. By having less preoccupation with our possessions, we will be more conscious about our spending. As I continue the practice of having a place for everything, I have caught myself asking "Where will I put this?" if I consider making a purchase. I have asked myself if I really need something that I desire (like that adorable water bottle I put back at IKEA). I can see my tendency to impulse buy decreasing as I question the need and the use for items. And it is so refreshing to make buying decisions from a place that isn't financial while still being financially sound. My mind is pretty much blown. I am not as attached to money as a number or self-defined by what I do or do not have. 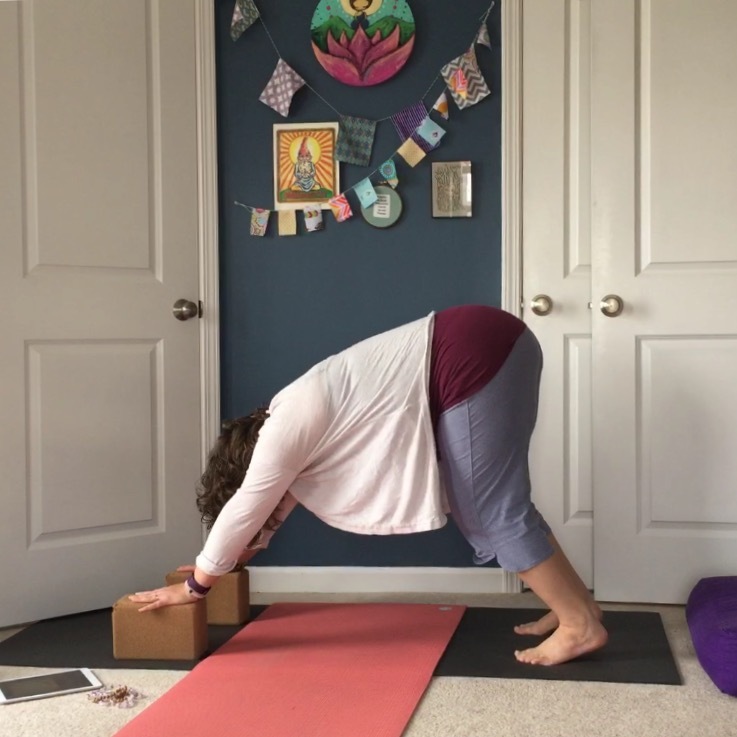 I also love what Anna from Curvy Yoga is teaching here about Aparigraha. She broadens the concept to include being unattached to the results of a process and instead softening into it. I want to better my health, but am not attached to reaching a certain weight. I want to build my coaching business with as much effort as I have to give, but be open to - not obsessed with - what comes next. I love what she says about anchoring in the beauty of the process and not the outcome. Thinking about my pursuits this way is so empowering. I do what I can do, I work to my best effort each day (Lenten promise keeps going! ), and then I roll with what comes next. Without being caught up in stats beyond a weekly check. Without stepping on the scale every day. Without worrying about what happens next. Giving my best effort and having non-attachment with the result. I'm not here yet. I still catch myself creating long-range money plans and "if I eat this way I can make this much progress" plans. But having an awareness of my connection to results is helping me turn that part of my brain to a more peaceful place. I am starting to think about those results thoughts as the clutter that I cleared out of my house. 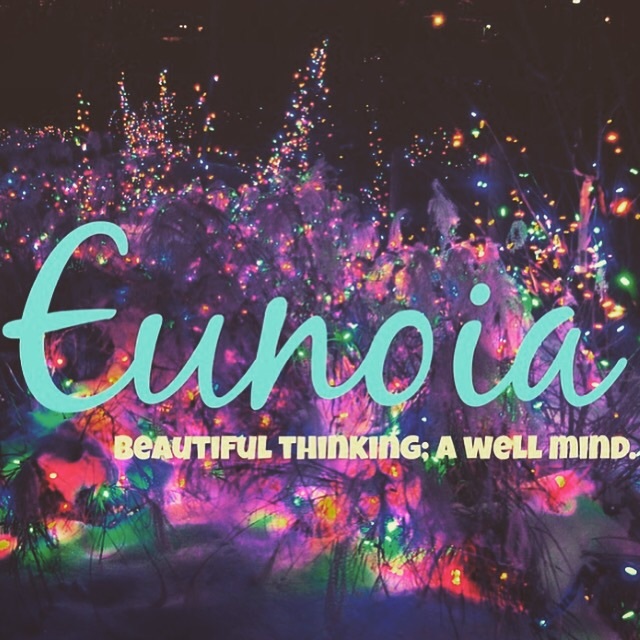 Eunoia started today, but it isn't too late to join in! You can read today's email here (to get just a taste and see if you're interested!). You can find more information - including registration information - here. “Your task is not to seek for love, but merely to seek and find all the barriers within yourself that you have built against it.” A Course in Miracles I’m a huge fan of Danielle Laporte. (Note to self: Write up Desire Map review.) So when DeeLaP (that’s what all her friends call her, right?) recommended Gabrielle Bernstein’s May Cause Miracles, I had to jump at the book. I was looking for something to work through. I am at a point in my life where I can fall prey to anxiety and overwhelm, but at the same time I feel like the things that are happening in my life are magical and methodical. So, yeah. I have room for more miracles in my life. I wasn’t sure how I’d feel about the book once I got it. I flipped through and thought, “Uh oh. This feels kinda woo-woo.” And, as touchy-feely-all-about-feelings as I am, I don’t appreciate out-right woo-woo. I typically don’t like the God/Universe/~ish/Higher Power lump either. So I had to make the decision to edit as I was reading and note-taking. That really helped. Otherwise, I just put my judgment aside and decided to jump in with both feet. The basic premise (which sounds basic but is so hard to implement) is that in every situation, you have two options: to see love or to see fear. To see an obstacle or to see an opportunity. Choosing fear creates all kinds of negative emotions. Choosing love (or sometimes I interchange love with grace) creates peace and connects us to God (however you define God), our internal truth, and the world around us. Something she wrote early on smacked me in the face something fierce. She writes about the importance of self-love and self-acceptance as an altruistic measure. She says that by showing love and acceptance to ourselves, we create an internal environment that leads to projecting love and acceptance to the world around us. How can we expect to be successful members of a well-functioning society when we aren’t able to be kind to ourselves? I can’t tell you how far my stomach dropped when I read that. So it isn’t realistic for me to expect that I can best help others when I have a negative self-talk loop in my head, is it? That called me to the carpet and made total sense to me. I will be better able to help others become focused and peaceful as I become focused and peaceful. Wow. Boom. The daily tasks are organized in weekly topics: identify fear, self-love, food/body image, relationships, finances, and being a miracle worker in the world. I have just started the relationships chapter, but am already looking forward to going back and spending more time in the body image material when I complete the program. Because I feel this book is so challenging, I knew right away that I wanted to use it as the text in a group coaching setting, but I wasn’t sure at what point. I thought I would at least finish the book first. But as I started thinking what I wanted to do for a Lent challenge, this book just kept creeping back up. It challenges your perception of the world, both internal and external. It encourages connection to whatever version of God/Universe/Higher Power/~ing you identify with (if any at all). It is just very well suited for Lent. 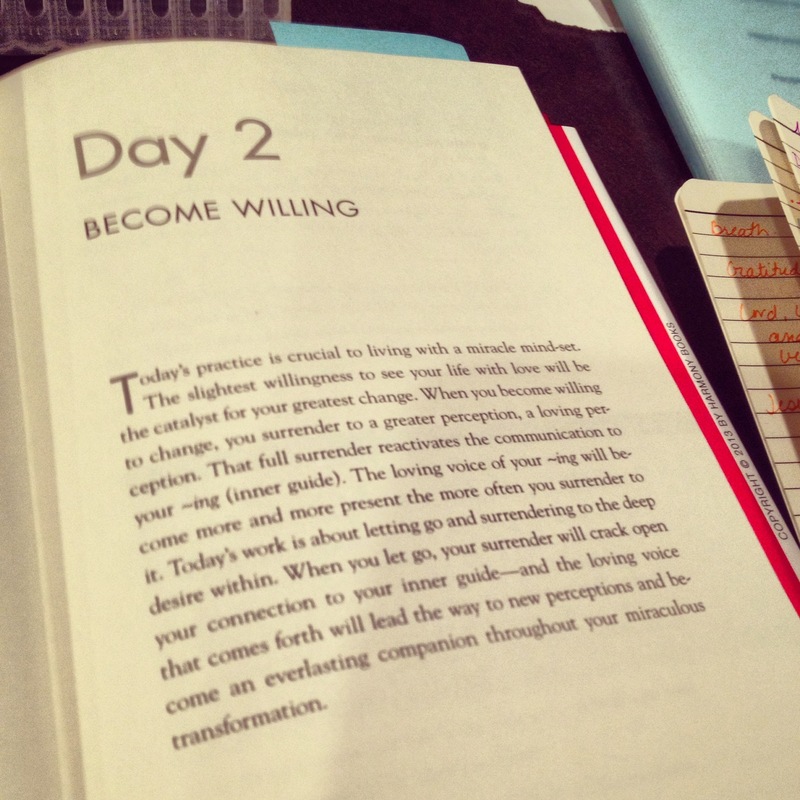 Challengers will work through May Cause Miracles by Gabrielle Bernstein as a group. You will be able to discuss and work through the book on a private facebook page, which I will moderate and participate in. You will receive a weekly reflections newsletter to tie up the end of each section of the book (on Sundays). I will offer additional insights and challenges on each topic in the book (general outlook, self-talk, body image, relationships, finances, serving others). Those registering for the full experience will receive frequent texts from me (3-4 times a week, if not more often) to hold you accountable to your Lenten promise, to process any feelings uncovered by the text, and to provide feedback on the reflections. The challenge will begin on February 13th and end on March 31. Registration will close February 11 to allow time for us to discuss your Lenten promise. You will be required to purchase May Cause Miracles by Gabrielle Bernstein (it is currently $12.99 at Amazon). I will not be sending the affirmations, reflections, or meditations from the book in any format. This is like the text book for a class. One that you will really have to read. You will need to have your book in hand and ready to roll on February 17. I am limiting the number of participants in this challenge to promote positive life fit for me. The challenge may close before February 11 if the course is full, so register early. The cost of the full challenge is $150. This is the typical cost of my accountability coaching alone for six weeks, to which you are additionally receiving newsletters, group interactions, and a printable. The reflection/printable/facebook only option for $75. You will not receive accountability coaching. Fill out the registration form below and I will invoice you through PayPal. Please let me know what questions you have. I look forward to working through Lent with you. Feel free to comment here with any questions. You can click here to register. I am so excited about this. And excited to watch my friends grow. And to check off days on the beautiful printable. Good times all around!